The Martian by Andy Weir is a science fiction must read, that is currently taking the bestseller list by storm. So, you're part of a mission to Mars, and you end up being injured, stranded, and without communications. And that's just Chapter One. I don't know about you, but I can't wait to find out what happens next! The Martian is written mostly as a series of log entries, making it even more compelling, as I feel like Mark is speaking directly to me. I was mesmerized from the beginning by the suspense and by the remarkable ingenuity of this character. Using science and engineering to solve problems in a realistic way, Mark must continuously find ways to survive and overcome the stacking odds against him. The author does a marvelous job of explaining details so that non-sciency readers can understand what is happening, yet there's enough tech to make any sci fi fan happy. Overall, this is one of the best books I've read over the past year. I haven't enjoyed a science fiction book as much as this since reading Ender's Game. The Martian is currently making it's rounds in my house as my family devours it--and we are looking forward to seeing it on the big screen. 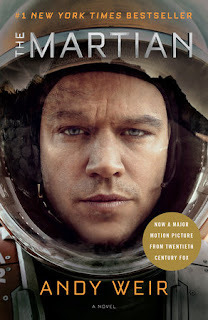 The publisher provided a review copy of The Martian.